For more information about Duke of Edinburgh Awards, our extra curricular sports activities and our Young Engineer competition please use the links below. Whether it is a Science Club or Chaplaincy group you are looking to get involved with, here at St Thomas More Catholic Academy, we pride ourselves in bringing variety and a choice of experiences to the students, allowing them to find their passions and to fully engage with the staff on bringing these clubs to their optimum levels. Through the dedicated staff, our clubs offer an opportunity for every student to explore their interests, for example, Head Boy of 2017 has given a talk in Parliament after being picked to help champion a national campaign about speaking skills. 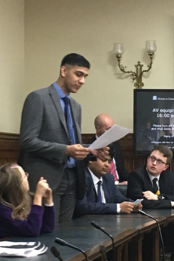 Mr Rayner and Khurram and Zoheb Ishfaq travelled to London in April, and Khurram got to share his ideas with MPs, education leaders, communication specialists and children’s minister Nadim Zahawi. Khurram talked about his experiences growing up in Stoke-on-Trent and some of the barriers that young people need to overcome before attending university. He spoke about the support he has received at St Thomas More including a Teach First mentor, a residential trip to Cambridge, organised work experience and support throughout the UCAS application process. 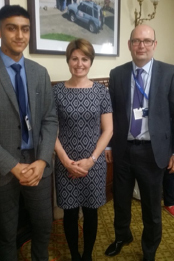 He was invited to the event in Parliament after the English Speaking Board recently heard him give a talk at the launch of Stoke-on-Trent’s Opportunity Area programme held at St Thomas More Catholic Academy. Khurram was one of several young people from all over the country to share their experiences in front of the MPs at the event. The politicians included former teacher Emma Hardy, who organised the session in partnership with the English Speaking Union. She’s now hoping to set up a cross-party Parliamentary group to help raise the profile of Oracy work in schools.